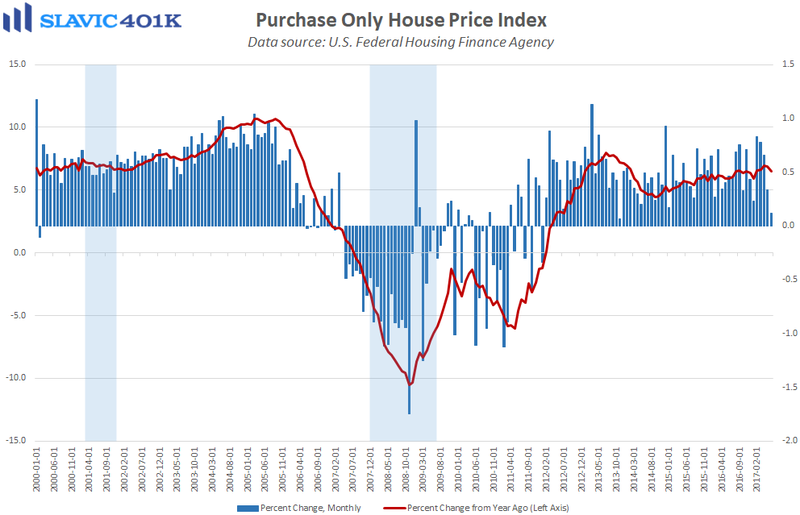 The Federal Housing Finance Agency’s (FHFA’s) national home price index (HPI) rose by 0.1 percent in June (lagged release), down from May’s 0.4 percent increase and well below the 0.5 percent gain economists expected. On a year-over-year basis, home prices grew by 6.5 percent in June, down from 6.9 percent in May and the slowest pace of annual growth recorded since January. Despite the recent weakness, the HPI has still risen for 65 months in a row, and home prices have increased in 48 states and the District of Columbia between the second quarter of 2016 and Q2 2017, according to the FHFA. The top five states in terms of annual appreciation were Washington (+12.4 percent), Colorado (+10.4 percent), Idaho (+10.3 percent), Florida (+9.4 percent), and Utah (+9.2 percent). FHFA senior economist William Doerner added that “New home sales are climbing but, relative to the overall population, they still remain low from a historical perspective. 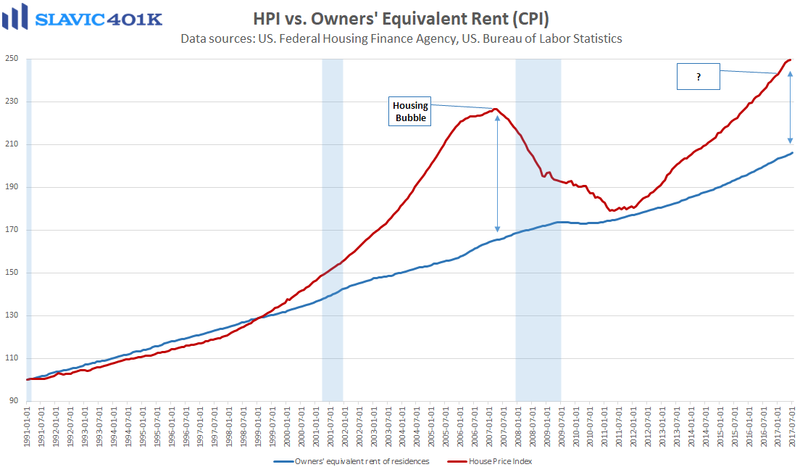 The tight inventory is a major explanation for why house prices have been increasing every quarter over the last six years.” Some economists like to compare the HPI to the owners' equivalent rent section of the monthly consumer price index (CPI) report from the U.S. Bureau of Labor Statistics to help spot price bubbles. As the chart below shows, home values have increased significantly in recent years but remain below the extremes seen prior to the last recession.